Mumbai: Private equity (PE) funds are pumping money into India’s non-banking financial companies (NBFCs), which have recorded higher margins and lower delinquencies, on expectations that falling interest rates will boost borrowing and consumption. There have been 11 transactions worth $750 million involving NBFCs so far this year, according to data compiled by investment tracker Venture Intelligence. This follows $920 million that PEs invested in NBFCs last year. On 15 September, Hero FinCorp Ltd, an NBFC from the Hero Group, announced the raising of Rs1,000 crore, while a fortnight earlier, AION Capital Partners Ltd completed the purchase of the commercial lending and leasing business of GE Capital in India. The latter, pegged at around $350 million, is one of the largest deals in India’s financial services. Meanwhile, ICICI Home Finance, the mortgage arm of ICICI Bank Ltd, and Karvy Finance, the NBFC business from Karvy Group, are also on the block. The financial services sector is “clearly standing out", said Sanjeev Krishnan, partner and leader (private equity and transaction services), PwC India. “Typically, it is considered a proxy for economic growth. PE funds believe that we are at the start of a four to five year good run in terms of economic growth. As a fund, they would want to enter and exit within the growth cycle. 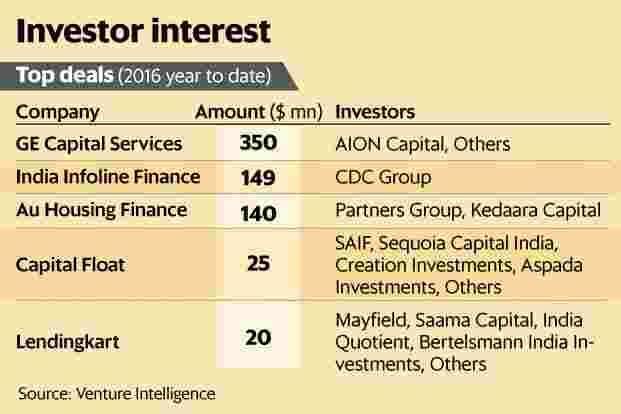 For the PE funds, this is a sector that comes across as one such opportunity," he added. In July, the International Monetary Fund predicted that the Indian economy will grow at 7.4% in 2016-17, faster than the Chinese economy’s growth pace of 6.6%. Changing demographics and low credit penetration have made NBFCs attractive, said Prakash Nene, a partner at PE firm Multiples Alternate Asset Management Pvt. Ltd. Besides, aspirations are rising faster than average income levels, he said. “People in the age group of 25-35 are more educated, well travelled and their aspirations today are higher than what they used to be two decades ago. So, consumer loans, personal loans, housing loans... these products have seen strong demand," he said. In June 2015, Mint reported that Multiples PE is incubating a mortgage lender to target urban lower and middle classes who work in the informal sector. NBFCs also stand to gain from banks’ unwillingness to lend to the informal sector, self-employed or people who do not have credit histories, Nene said. Most PEs are looking at retail lenders as they expect a credit-fuelled consumption boom. Indians save an average of 25-30% of their income, but this may not be enough to satisfy all their requirements, said Khushroo Panthaky, director at Grant Thornton Advisory Pvt. Ltd. “Also, as one’s purchasing power becomes higher, the needs also multiply, driving the need for more credit." Outstanding retail loans as of 22 July were Rs14.48 trillion, up 18.8% from a year ago, according to latest data available from the Reserve Bank of India. Some of the fastest growing categories were loans for consumer durables (18.4%) credit cards (29.4%) and personal loans (27.9%). Krishnan says retail lending NBFCs are more attractive to PE funds. “If you look at retail lending, the delinquency is low. Margins too are better compared to wholesale lending businesses. The demand for these products is strong and the economics are better, so the investors are buying into both the strong consumption story and the economics," he said. Interest rates that are expected to head lower will help NBFCs as credit offtake grows, Panthaky said. Since January 2015, India’s benchmark interest rates are down by 1.25%. PE funds are also encouraged by the successful exits made by other PEs. Most of them have benefited from their NBFC investments, said Ritesh Chandra, executive director at Avendus Capital Pvt. Ltd. “Given the robust growth in the credit trajectory of most NBFCs, they have had to raise equity capital from PE investors periodically to shore up their capital base. Concurrently, with these primary capital raises, existing PE funds have sold their stakes to incoming investors and have recorded profitable exits." In 2016, PEs have been able to sell investments in five deals worth $432 million, according to Venture Intelligence. It was $539 million across 11 deals in 2015. In May 2015, TPG Capital sold its 20.37% stake in Shriram City Union Finance for $387 million. On 2 September, Apax Partners Llp sold around Rs680 crore worth of stake in Cholamandalam Investment and Finance Co. Ltd in a block deal. The partial exit generated an internal rate of return of over 50%, Mint reported. In one of the most successful NBFC exits, in 2009, PE firm ChrysCapital earned more than Rs1,400 crore on a Rs100-120 crore investment it made in Shriram Transport Finance Co. Ltd.